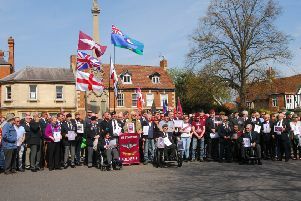 Members of the UK’s armed forces past and present were honoured in unique style during Armed Forces Week in Sleaford. Events culminated in a drumhead service in Sleaford Market Place on Saturday which celebrated the town’s adoption 75 years ago of HMS Sheldrake during the Second World War, raising £134,000 for Warships Week. The ship’s bell had pride of place in the ceremony with standards lowered by veterans organisations and the commemorations led by Rev Philip Johnson and former Mayor Garry Titmus, himself a former naval officer who explained about the town’s links to the ship. On Friday, at North Kesteven District Council’s Sleaford offices, almost 100 guests celebrated the contribution of veterans and current personnel to the community. In its twelfth year, the annual presentation of Veteran’s Badges saw pin badges awarded to 14 people in recognition of the service in the British Army, Royal Navy and Royal Air Force. These included two Second World War Veterans - Jack Powditch, 98, of Sleaford, was one of the first people to join up in Lincoln in 1939 and served with the Royal Engineers, and Flight Engineer Les Anderson, 92, followed up his war service with flying global humanitarian missions. The evening featured music by Miller Magic, was introduced by Leader of the Council Coun Richard Wright and compéred by BBC Radio Lincolnshire’s Howard Leader, with RAF Digby Station Commander, Wing Commander Tom Ashbridge presenting the awards. Captain Spicer, grandson of the last Commanding Officer of HMS Sheldrake, also attended. In addition to the badge presentation, certificates were presented to school design competition winner Alex Leeson of Kirkby la Thorpe Primary School and Sleaford shop window design winners Lunettes. Coun Wright said the Veteran’s Evening and annual badge presentation were believed to be unique to North Kesteven; a distinctly local celebration of the strong ties and mutual respect of the civilian and military communities within the District and the ways through which service personnel – past present and future – enrich all of our lives and broader society. The council extends an invitation to people from beyond the District boundary too. Wing Commander Ashbridge reflected the two-way relationship of Armed Forces Day celebrations, in allowing Forces personnel to say thank you to the communities which support them. “RAF Digby works 24/7 in support of operations across the world – day in, day out – and we can only do that with the support of the community; we can’t work alone,” he said. “We are absolutely dependent on the help of everybody around us in making that happen: the doctors, the schools, the hospitals, shops and councils. All of those people come together to be a supportive community and we are very lucky in North Kesteven to have such a military-focused community around us. “This community of North Kesteven really understands the Armed Forces and makes us feel at home, which allows us to do our jobs even better. You give us the strength to do what we do. Martin Thomas – served with the RAF from 1977 to 1991. Ken Fernandes – a Sleaford Town Councillor who served with the RAF from 1970 to 1992. Paul Crossman – an ex RAF musician who eventually ended up at RAF Cranwell from where he carried out medical duties in the First Gulf War before taking on the role of Drum Major. Now the Welfare Officer for the Cranwell Branch of the Royal Air Force Association. John Ingram – served from 1961 to 1986, most recently at RAF Digby. Roy Allen – a photographer in the RAF for 10 years from 1960 to 1970. Jack Powditch – of Sleaford, aged 98. Back in 1939 he was one of the first people to join up in Lincoln on the outbreak of war, serving with the Royal Engineers 561 Field Company from 1939 to 1945, seeing active service in Africa alongside the Desert Rats and taking part in beach landings. His badge was collected on his behalf by Rachel Budd. Alfred Antell – from Waddington, in the Royal Navy from 1954 to 1978. Les Anderson – aged 92. Moved to Sleaford last year, quickly joining in with the new Cameraderie Club and finding lots of new friends. Enrolled in 1943 as flight engineer, flying in Halifaxes and Lancasters, training other aircrew, and going on to flying worldwide humanitarian missions with Transport Command. James Burrows – of Anwick, a submariner in the Royal Navy from 1961 to 1972. Tony Gordon – of Sleaford, served in the RAF from 1965 to 1993. Christopher Howard – of Boston, served in the RAF from 1958 to 1961. Peter Willey – of Ewerby, served in the Royal Army Pay Corps and Adjutant General’s Corps from 1978 to 2001. Sarah Coupland – from Bracebridge Heath, served from 1948 to 1950 as an Equipment Assistant at RAF Scampton. Brian Kirby – of North Hykeham, a member of the National Malaya and Borneo Veterans’ association, having served from 1955 to 1967.